Ahh it’s been a while! Sorry everyone, busy season got real bad at the end. But that is in the past and I have some exciting news (and then some recipes to catch you up on)! As of November 1 I will be transferring into PwC’s financial education practice. I have worked on some projects with this group in the past and I am beyond excited for the transition. This has been in the works since June and my current partner and the partner of the new group agreed that I could make the switch after busy season. So what will I be doing? Basically companies hire PwC’s financial education to be a benefit to their employees. We do in person presentations on financial planning topics such as cash and debt management, 401(k), pre-retirement planning, and topics like that. We also have a phone line that the employees can call and ask us financial planning questions, anddd one of my favorite things we have is a “financial fitness assessment.” The employees can take this and then schedule a one on one call with me or one of my teammates. Alright, now to the recipes. We made a couple during the last weeks of busy season but I didn’t have time to post them! 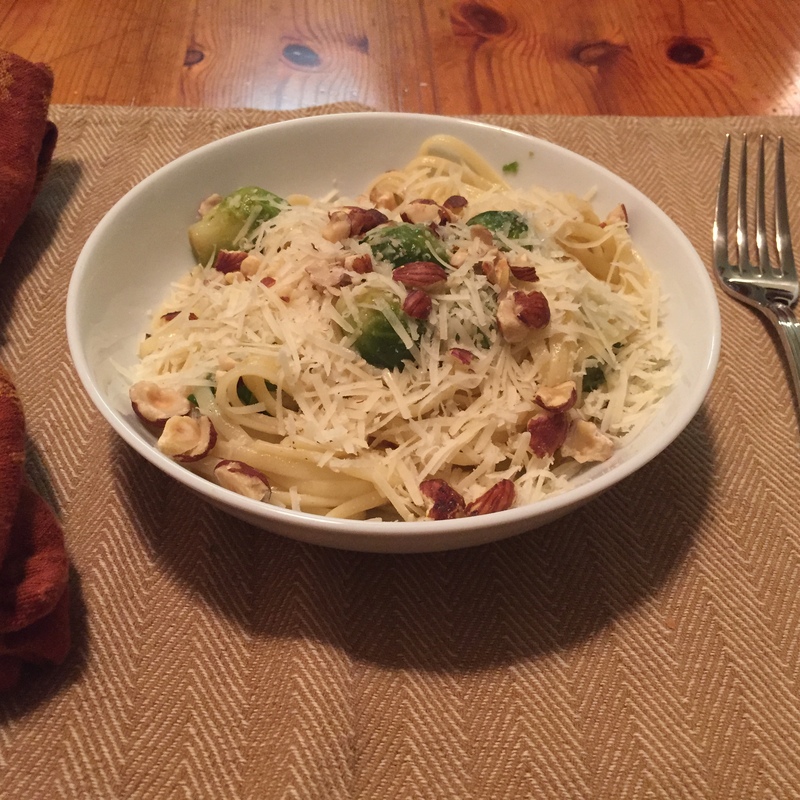 First up – Brown Butter Brussels Sprouts and Fettucine. This was pretty delicious, Matt made it one night during busy season and added garlic to the original recipe – great call on his part. 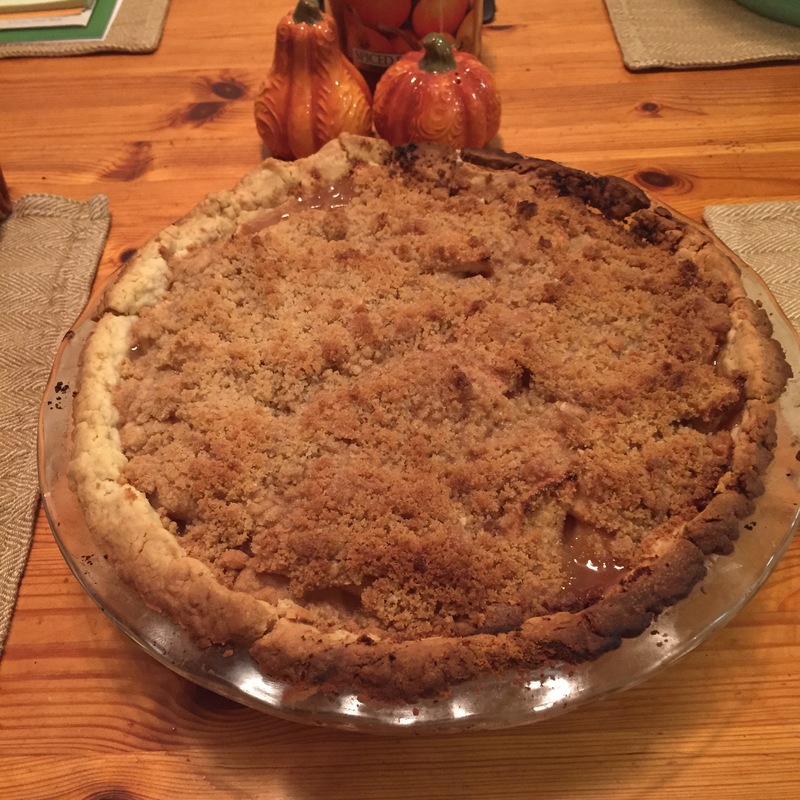 Second Up – Apple Pie with a French Crumble. We went apple picking with our friends a few Sundays ago and somebody thought that we needed 12 lbs of apples, so there were plenty around for making a pie. Lastly – we got Blue Apron this week (thanks to my bday gift from my brother)! The recipe from the first meal we made had fairly normal ingredients that’s easy enough to remake, and it was pretty delicious too! Cook fettuccine according to the package instructions. 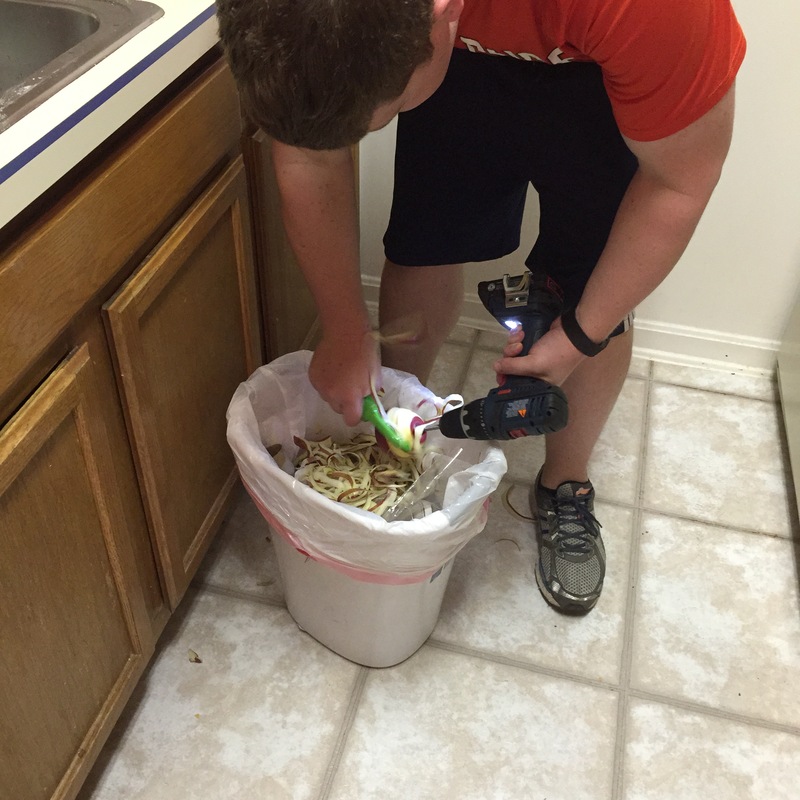 Drain, reserving 1 cup of the pasta water. Add sprouts; cook until tender, 5 minutes. Stir in pasta, cooking liquid and 1/2 cup each cheese and nuts; season. Top with remaining cheese and nuts. Cut shortening into flour and salt until particles are the size of small peas (this can also be done in a food processor or a kitchen aid mixer with the whisk add on. Gather the pastry into a ball; shape into a flattened round on lightly floured surface. Roll pastry 2 inches larger than the inverted pie plate. Transfer crust into the pie plate and trim/shape the edges as desired. Combine, sugar, flour, nutmeg, cinnamon, and salt, then stir in apples. Pour into the pie dish (already lined with raw crust). Mix the crumb topping ingredients (flour, butter, brown sugar) until crumbly. Top pie with crumble before baking. Bake 50 minutes, cover pie with foil during the last 10-15 minutes of baking to avoid excessive browning. Matt helped peel the apples! anyone seen that video of using a drill to peel apples? He saw it and had to try it! 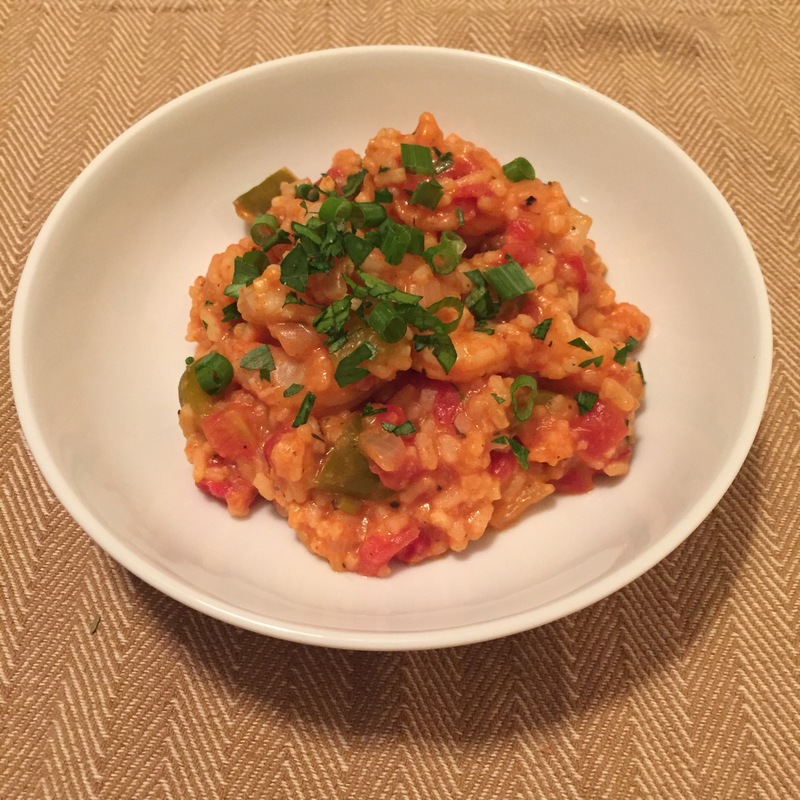 Eh, just go to the website for the recipe – https://www.blueapron.com/recipes/one-pot-shrimp-perloo. Blue Apron has pretty recipe cards you can print too. Picture is below, it was delicious and definitely made more than two servings.